There are lots of great Christmas presents for dogs, but there is not one that they are likely to appreciate more than an automatic fetch machine. Your dog loves playing fetch, but you are not always available to play with him or her. You have work, responsibilities and sometimes even a tired arm. But in automatic fetch machine, sometimes commonly called an automatic ball thrower, is a device that never gets tired of playing fetch with your dog. If you can train your puppy how to use it properly, then you will only have to play fetch with them as long as you want to. It’s one of the many ways that robotic devices are changing the way we interact with our pets. But knowing that you need one is not the same as knowing how to buy one. This buying guide will show you exactly what to look for when buying automatic fetch machine, as well as review some of the best that are out there. Let’s look at five of the top automatic fetch machines that are currently on the market. These have all the features that you need to make your dog happy, and they are some of the top choices among dog owners and dog experts when it comes to automatic ball throwers. They are perfect for all kinds of breeds including Boxers, Great Danes, Golden Retrievers and Labrador Retrievers. The first automatic ball launcher on our list is from iFetch and it is a very useful and functional automatic ball launcher so the dogs can play fetch is much as they like. There are couple of improvements that could be made, but overall this is one of the best ball launchers on the market. The first thing the need to understand about this automatic fetch machine is that it is made for larger dogs. 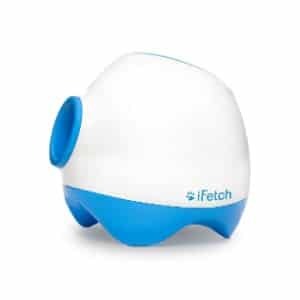 If you have smaller dogs, then you want to go with the iFetch machine that is specifically intended for those smaller dogs. The second thing to know about this machine is that it will only launch tennis balls or balls that are the same size. It does come with its own balls, which is nice, and it’s pretty easy to use. The way that this machine works is that there is a tub at the top where your dog can drop the ball back in and it loads it up and sends it rolling across the ground. There are three different launch distance to choose from which include 10 feet, 25 feet and 40 feet. You can easily change this with a button located on the unit. It is also battery-operated and very portable, so you can take it with you anywhere you like. The batteries rechargeable, so you don’t have to replace it, and the throwing motion is smooth and easy for your dog to track. The nice thing about this particular automatic fetch machine is that you can use it indoors or outdoors. With the smallest range being 10 feet, you can easily use it indoors as long as you have cleared the way in front of it. The ball rolls along the ground for the most part instead of being shot straight out, so it is perfectly safe for indoors as long as you take precautions. The only thing to keep in mind is that you have to keep the ball clean and free of dirt or else the machine can sometimes get stuck. Even so, this is still one of the best automatic fetch machines on the market. 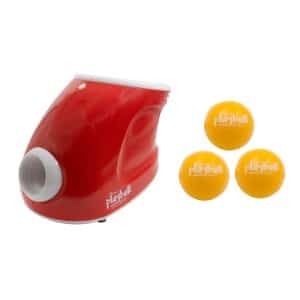 This PetSafe automatic fetch machine is a much more powerful ball launcher then the automatic fetch machine above, and it actually shoots the ball through the air and pretty far away. Although the ball can move really fast, there is a motion sensor directly in front of the launch area to prevent anyone from being hit by the ball when it is getting ready to fire. It is also really easy to train your dog to fetch using this machine, because the tray where you insert the ball is large and there is a distinct sound that happens right before the ball actually launches. That means that your dog can prepare for the fetching when that sound occurs. But that’s just one of the advantages that this automatic fetch machine has over the competition. The truth is, there are actually multiple sensors that prevent accidents from happening, including the one positioned directly in front of the firing mechanism. Plus, balls actually load from the side and not from the top or anywhere near the opening and the front motion sensor will protect anyone standing near than seven feet away. The launcher will throw between eight and 30 feet away with nine different settings for you to choose the perfect distance for your dog. There is a knob that you used to adjust distance, which is very easy to use, and this can be used indoors and outdoors. If you do use it indoors, you can plug it in, or you can use an extension cord outdoors. However, this also can operate with six D cell batteries, but you have to get them separately. The nice thing about this ball launcher is that it works with standard size tennis balls like most of the automatic fetch machines on the market, but it can also work with balls that are smaller in diameter. That way if you want to play with both the large dog and a small dog, you can do both because large dogs can get their mouths around tennis balls, but small dogs have trouble with those. Up to three balls can be loaded at the same time, and it comes with a terrific warranty and from one of the best brands in the business. This iDogmate ball launcher will give your dog hours of play thanks to a winning design and some really smart features. Let’s talk about distance first. There are four different distant settings that you can switch between, with the nearest 10 feet and the farthest up to 50 feet away. You can also set it for 20 feet and 40 feet. 50 feet is one of the farthest distances for automatic ball launchers on the market. What is really useful is that incorporates a random feature so that your dog never goes how far the box going to go. This makes the even more fun, and keeps them from getting bored. This automatic fetch machine is almost like a human being is throwing the ball. There are lots of other cool features as well, including the fact that it has both a power cord and uses three standard lithium-ion batteries. You can use it indoors or outdoors, thanks to a pretty incredible launch design that throws the ball nearer to the ground with a slight arc to it. It is also rechargeable so you don’t have to worry about replacing the batteries, and it uses balls that are included with it. They are non-toxic and nonabrasive felt so they are going to damage your dog’s teeth, and you can get a smaller unit if you need smaller balls for dogs that cannot get their mouths around these tennis-sized balls. One of the nicest features of this particular automatic fetch machine is the remote control that allows you to perform all of the functions of this automatic Ball launcher. You can change the distance, wants the ball, turn the machine off and other functions as well. This is perfect for breeds like German Shepherds, French Bulldogs, Beagles and Huskies, but you may have to get the smaller unit for Poodles and Yorkshire Terriers. This is an automatic Ball thrower for dogs that will work with an outdoor dog kennel if it is close to 10 feet, and it can even work indoors in a large dog playpen. You may want to combine it with accessories like dog activity monitors to see how much your dog uses the automatic fetch machine. This Couch Potato automatic fetch machine is one of the budget options here on this list, but it is still an extremely effective automatic ball thrower for dogs. There are three different distances that you get to choose from, and although they are all fairly short, what that basically means is that you are able to use the unit inside pretty much anywhere. This is the perfect size for smaller dogs, and just like your dog crate, dog bed or dog house, you want to get the perfect size for your dog. That’s exactly what this provides for those who have smaller dogs. You can also use outside in conjunction with a GPS tracker for dogs, but it is extremely useful indoors. You will really love how simple and easy this automatic fetch machine is to use. It has a smooth launching function, launching miniature balls that fly through the air for a short distance and roll across the floor. It is perfect for small balls, but you definitely do not want to use it for large dogs because they could choke on the balls that are provided with it. The balls that come with it are saliva resistant so they are not going to jam up the machine and a light-up setting shows the distance that is selected. It does come with a power cord and has no battery so you will have to plug it in whether you use it indoors or outdoors. However, outdoors is probably not the best idea anyway, since the ball will hit the grass quickly and stop rolling. This is a really easy to use indoor automatic fetch machine that your dog will love. If you have a small dog, then you want to go with this one instead of the other ones that have been reviewed here, because it is much better suited for those dogs with really small mouths. 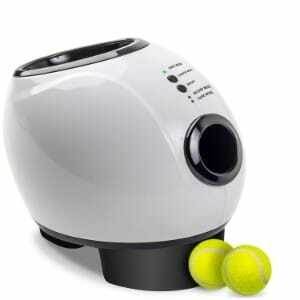 From Paws & Pals, this automatic fetch machine is very similar to the one reviewed above. It is made for smaller dogs, and like the other one, it has three different settings to give you exactly the right distance. It uses smaller balls, and is intended for dogs that have small mouths and cannot get a bite into the regular tennis balls that are used for larger dogs, as well as lacking the strength to do any real damage indoors. That makes this the perfect automatic fetch machine to use inside your house, as long as you take a few precautions and make sure that anything valuable that could accidentally get tipped over is out-of-the-way. When most people want their dog to get some exercise, they put on the dog collar or dog harness and go out with pooper scooper and poop bag in hand to take their dog for a walk. This is obviously a great way to bond with your dog, but you don’t always have time for a real walk. In fact, you’d always have time to play with your dog is much as they would like to play. That is exactly where an automatic fetch machine comes in. 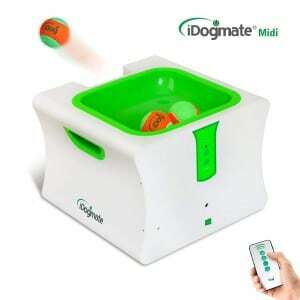 An automatic fetch machine like this one allows your dog to chase down balls and reset the machine themselves – once they are trained of course – so that they can get as much exercise as they desire. This will mean that the quality time that you spend with them will be even more special because they will not have the energy that makes them overexcited. This particular automatic Ball launcher may not be the most fully featured automatic fetch machine on the market, nor is it appropriate for larger dogs, you have a small dog, then it might just be the perfect solution to getting them the exercise that they need and desire. There are lots of things that you want to keep in mind when it comes to choosing an automatic fetch machine. Just like getting the right dog ramp is vital to dogs that have trouble getting up on high places, or ensuring that you have cooling pads for dogs or cooling vests for dogs if the temperature is too high outside or indoors, making sure that you get the right automatic fetch machine is vital to the happiness of your pup. In this buying guide, we are going to go over everything that you need to know before buying an automatic fetch machine for your own dog. There are definitely a lot of things to keep in mind, from choosing the right one for your dog’s particular size or activity level, to making sure that you get the features that you need. Even the type of ball that is used is a major consideration. Other features that you want to consider include the strength of the automatic fetch machine, how much distance of the ball travels and what kind of power source and has – whether it needs to be plugged in or if it has a battery that you have to replace or recharge. These are all important considerations when it comes to choosing an automatic fetch machine, in this buying guide will be able to give you the guidance that you need. So, why do dogs love playing fetch so much? Everyone knows the dogs love playing fetch. But no one probably thinks about why. The reason that dogs are so obsessed with the game of fetch is due to their instincts from before they were domesticated. Just like wild animals that you might see on the National Geographic Channel, dogs were not always the pets of humans eating out of a dish or bowl. Instead, dogs chased down their dog food and killed it. That instinct is still there, and just like skydiving or participating in some other exciting activity for humans, dogs love the thrill of the chase. Playing fetch with them invokes those same urges and instincts. Your dog no longer has to hunt down the food that he or she eats, but they still want to hunt something down. It makes them very happy to be able to chase something and get the satisfaction of catching it. Doing this over and over again is pure ecstasy. If you want your dog to have that kind of happiness, then you either have to play fetch with them over and over or you have to get in automatic fetch machine that they can reset themselves and that will give them the challenge of launching a ball that they can run after, find and catch. These skills keep your dog sharp as well as giving them a great deal of entertainment. There are lots of benefits to having an automatic fetch machine for your dog. The first is that you are able to alleviate canine boredom. If you spend all day at work, and your dog spends all day inside, they can get really bored. Dogs do not read books or watch TV like humans do, so they need something to occupy their time. Having automatic fetch machine that they can start up themselves by dropping a ball in gives him a toy that they can play with whenever they want. In addition, in automatic fetch machine provides them with a great deal of exercise. Dogs need exercise to stay healthy. Even if you take them on walks, they are not going to be running at full speed like they would if they were chasing down the ball. As long as you take proper precautions inside your house, there should be no problem with getting your dog chase down in automatic fetch machine for exercise. If you have a larger dog though, it may be more prudent to set it up outside and install a doggy door so they can get out to play with it. There is also the benefit of preventing anxiety and saving many of the items around your house that they might chew up because of anxiety or boredom. Lots of dogs chew up shoes or destroy rolls of toilet paper, spreading them all over the house, when they are bored or feeling anxious. An automatic fetch machine can provide them with enough exercise to wear them out and burn off excess energy, alleviating both boredom and anxiety. Getting your dog used to an automatic fetch machine takes a little bit of work. You have to work with your dog to get them used to the machine. You also have to teach them how to use it. The way that you should start is by setting up the machine and then going to stand beside it and throwing balls in the same direction that the machine will be launching them so that they can see exactly what will happen when the machine turns on. Once they have gotten used to balls going in that direction, then you want to turn the machine on and let it throw the balls that your dog will be chasing down. Most automatic fetch machines have some kind of tone or alert the lets the dog know when the ball is going to be launched, and you have to get them used to that sound. Make sure that you are using treats or another training tool to get them to stand to the side of the machine, because some of them actually have motion sensors that will prevent the ball from being launched if your dog is standing in front of it. Finally, get your dog to fetch the balls that are coming out of the machine, and teach them how to drop the ball in the proper place so that the automatic fetch machine reloads and they are able to play again. If you can teach your dog this, they can have an unlimited amount of fun by replacing the ball and waiting for it to be launched again. Now, let’s look at some of the factors the want to keep in mind when it comes to an automatic fetch machine. There are a lot of them on the market, and they all have different features that you need to be aware of. However, the features that are listed here are by and large the most common ones, and they are what you’re going to be looking for when you are evaluating each individual automatic ball launcher. Let’s take a look at each of them one by one. One of the first things that you want to look for is an automatic ball launcher that is really versatile. You don’t want it to only be used indoors or outdoors, which means that you need to take into consideration things like the power supply, the distance it travels, the speed of the ball and various other features. Some of them we will be covering individually, but overall versatility is important because you want to be able to use anywhere for multiple types of dogs, which means that you want to look for automatic fetch machines that have a great deal of flexibility. The type of ball that is accepted is also pretty important. Most automatic fetch machines are specifically designed for a certain type of ball. In fact, some of them go so far as to include the balls that should go with the machine and make it difficult to use with other balls, even if they are the same size. But you want to have a machine that takes multiple types of balls. The first reason is that even if balls come with the machine, there is a possibility that they can get lost or destroyed, and you want to be able to provide your own balls instead of spending what is likely a great deal more on the ones sold by the company individually. But you also want to be able to use the machine with multiple dogs, and that can sometimes mean using a different ball for different dog. You also want to make sure that the distance settings are adjustable. Short distances are better for indoors, obviously, and long distances should be restricted to outdoors and for dogs that like to run. Most of the automatic fetch machines on the market come with at least three different distance settings. A common example is 10 feet, 20 feet and 30 feet. How far you need the ball to go will depend upon the size of your dog and how quickly they can move. For dogs that are older and do not move like they once did, you probably want to go at shorter distances. On the other hand, if you have a dog that can cover the yard in seconds, then you may want to choose a model that sends the ball 40 or 50 feet away. How easy your automatic fetch machine is to use is also a consideration. For example, are the switches easy to understand and can they be turned quickly? Some units come with a remote control that you can use to change the automatic fetch machine or shut it down from a different room or several feet away. You also want to make sure that it is easy to load the balls in. You’re going to be training your dog to put the balls back into the machine, and if the process is too complicated, then they are only to be able to use once because they will not be able to figure out how to get the balls back in. What kind of power supply your machine has is also something you want to think about. Many come with AC adapters that you can plug into the wall, while others have batteries. Some of them are rechargeable, while others have to have the batteries replaced. You can look on the description of the automatic fetch machine that you are considering and see what kind of power supply or battery is included, and then check customer reviews to find out how long the battery lasts before it needs changing or recharging and how reliable it is. There are certain safety features that you want to be aware of as well. For example, you want to make sure that your dog is going to be able to drop in the ball without any moving parts or anything else that could catch them if they were to put their nose down inside of the ball retrieval area. But you also want to make sure that there are motion sensors on your automatic fetch machine, especially if it is one of the more powerful ones, so that if your dog is standing in front of the launch area when it comes time to throw the ball, the machine waits until your dog is out of the way. You want to train your dog stand by the side of the machine, but the safety features still important. Let’s take a look at some of the advantages of an automatic fetch machine. First of all, there is the advantage of being able to give your dog something to do when you are not able to play fetch with them. When you set up an automatic fetch machine that they know how to use, they can turn the machine on by dropping a ball in and play to their heart’s content. If you have long hours at work, or if you have to be out of town for a couple of days, having an automatic fetch machine in the house or in the yard – combined with an electronic dog door – is a terrific way to keep your dog from getting bored. In addition, automatic fetch machines do not get tired like you do. You may love playing fetch with your dog, but after a while your arm is going to get tired. That doesn’t necessarily mean that your dog is gotten tired though, and so they may need more exercise but you are unable to give it. Having an automatic fetch machine that you can use when you get tired can be a major advantage. Finally, an automatic fetch machine can be a really safe way for your kids to play fetch with the dog. Some kids are too small to throw the ball far enough for your dog to go and retrieve it, but if you can teach smaller kids how to put the ball into the hole and allow it to launch, it will be almost as if they were playing fetch with your dog themselves. There are also some disadvantages to having an automatic fetch machine as well. For example, once you have one, it can be tempting to use it instead of playing fetch with your dog. This takes away some of that very important bonding time, but as long as you spend it doing something else, or play fetch with your dog once in a while it shouldn’t be a problem. Another disadvantage of automatic fetch machines as they can sometimes be temperamental. Some machines get clogged up when you drop balls that are covered in saliva and dirt into the unit. You want to look for this carefully when you are shopping, because if your machine stops working after your dog drops the ball in for the second time, then it isn’t worth the money that you spend on it no matter how inexpensive it was. Finally, having an indoor automatic fetch machine can be disadvantageous because there is the potential for an accident. If a ball bounces off of the wrong thing, it could knock over inexpensive knickknack or cause damage to a room. The bottom line is the automatic fetch machines are definitely great solutions to common problem – not being able to play fetch with your dog nearly enough. Dogs love playing fetch, and most people are simply not able to play with them enough. Human beings have jobs and responsibilities, and they cannot play fetch with their pet every day. But in automatic fetch machine can be there for you when you are busy. You just want to make sure that you know what to look for, including all of the factors listed above, and that you choose the right one. There are a lot of considerations when it comes to getting the best automatic fetch machine on the market, but this buying guide should give you some insights that will help you find the perfect one.